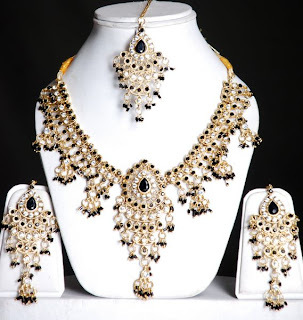 Look ravishing in the matchless beauty of this wedding Indian jewellery set In white and black Color. Heavy Set with Necklace, Earrings and Traditional MangTikka. The Beauty of the Set Is enhanced with sparkling Stones and Gems Studded All Over. Perfect to enhance your beauty! !